If you have a blender and a pie dish, you have all the hardware you need to make a great impossible sweet potato pie. In the late 60s, when cooking was considered an imposition not a glamorous pastime like it is today, the quicker and easier you could throw something together the better. Although some of these quick fix meals have thankfully been lost to the better taste of time, some quick tricks have withstood the test of time to become part of our culture, or at least a neat trick to impress friends. One of these great tricks came from the back of a Bisquick box. Yes, the same people who brought you the quick-fix pancake batter (you can make your own pancake mix pretty easily even if you don't happen to have Bisquick around) brought you the impossible pie. The original recipe was for the impossible coconut pie. This was the kind of recipe that once tried and brought to a party, church social, or family gathering the recipe would be passed along. As the recipe made its way from kitchen to kitchen, innovative home bakers started to work on their own variations. After you look at the recipe and realize how simple the recipe is, you might be inclined to ask "What makes it impossible?" Well the impossible sweet potato pie gets its name from the fact that the mix gets poured into an empty pie pan and yet somehow ends up with a thin crust once it's done cooking. This occurs because the flour that is blended into the pie mix settles as the pie bakes. This is not a real piecrust. In many ways, the impossible pie is a crustless pie because the crust that is formed is marginal at best. 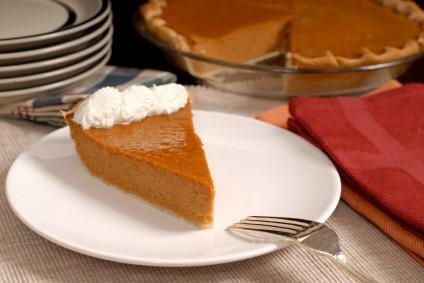 But real crust or not, once you taste a slice of impossible sweet potato pie, I think you'll be hooked. The first time I tried to make this pie I was a bit skeptical to say the least. Coming from a traditional cooking background and being taught at culinary school that all pies had a crust, I really didn't think that the impossible sweet potato pie recipe would work at all. But I was surprised that the pie turned out as tasty as it did and looked much better than I expected. I topped it with a Chantilly crème, but you can top it with whatever you happen to like to top your sweet potato pie. Mix Bisquick, sugar, spices, vanilla, eggs, prepared sweet potatoes, salt, and evaporated milk in a blender until smooth. Bake for 50 to 55 minutes or until knife inserted near center comes out clean. Serve topped with crème Chantilly. You can substitute the Bisquick with a cup of self rising flour, which works just as well. Crème Chantilly is heavy cream mixed with sugar and vanilla. I like to use a glass or Pyrex pie dish. I feel that they give a better coloring on the crust or, in this case, the Pyrex will show off the self-made piecrust. I also feel that the see-through pie dishes present better, by which I mean that when you bring them to the table to serve the pie they look very cool. For a nice taste variation crush about a 3/4 cup of pecans or walnuts and fold them into the pie mix.